2017 was a banner year for tourism in Israel, with a recorded 3.6 million tourists having visited the country, a 25% increase from 2016. Marketing efforts by the Ministry of Tourism, along with new flight routes, were critical in increasing the volume of tourism to the country, and in setting a new record for tourism statistics. These collaborations were instrumental in the establishment of no less than 18 new flight routes to the Ben-Guiron International airport. Direct flights from the United States and Europe were made available through Ryanair, LOT Polish Airlines, Icelandic-carrier WOW Airlines, and Wizz Air. Visitors from the United States represented most of the tourists, with an estimated 716,000 Americans having arrived between January and November. This represents a 21% increase from 2016. Tourists from Russia were the second largest visiting people group, with an estimated 307,000 tourists having visited in 2017. French and German tourists numbered at 284,000 and 202,000 visitors respectively, with tourists from the United Kingdom finishing off the top five at 185,000 tourists. Chinese tourists are still the largest Asian nationality to visit Israel, with 64,000 Chinese tourists having arrived in the first half of 2017, 66% more than the previous year. Israel has always welcomed tourists of all faiths, and more so in 2017. During December alone, tens of thousands of Christian tourists visited Jerusalem and other sites holy to Christianity. Out of all the tourists who visited Israel in 2017, 54% identified as Christian, with the remainder comprising different faiths. Efforts by the Ministry of Tourism to highlight the significant sites in the country gave tourists a more comprehensive itinerary for Israel. As in previous years, tourists flocked to Jerusalem, with 78% of all visitors having made a stop at the Holy City. 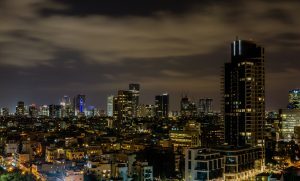 Tel Aviv-Jaffa was the second most popular destination, with 67% of tourists taking in the sites of the Mediterranean coast. 49% of tourists visited the Dead Sea area, while 35% of tourists explored the different areas of the Sea of Galilee and Tiberias. 2017 also saw numerous A-list celebrities visiting Israel. The Ministry of Tourism hosted almost 3,000 celebrities, journalists, sports stars, actors, opinion leaders, and bloggers from all around the world. Celebrities like Ashley Graham, William Levy, Justin Bieber, and even Mariah Carey all enjoyed Israeli hospitality. To honor the contributions of the Philippines to Jewish immigrants during the Second World War, Israel maintains a visa-free policy for all Filipino tourists planning to go to Israel. Filipino tourists are welcome to stay in Israel without a visa for up to 59 days, while special visas are available for Filipinos who seek to study or work in Israel.